The Sun Valley City Council voted last week to authorize a letter of commitment to purchase a new ladder fire truck. Mayor Dewayne Briscoe broke the deadlock on the vote Thursday, Sept. 5, after councilmen Nils Ribi and Franz Suhadolnik voted in favor of authorization, while council members Michelle Griffith and Bob Youngman voted against it. The authorization instructs city attorney Adam King to write a “letter of commitment” to buy the truck. After the meeting, Griffith said the issue is complicated. “The issue was whether a city can enter into a lease agreement because statute does not allow one council to hold over future councils for decision-making. You can only do it if you have a letter from the city attorney or a judicial ruling made on whether this purchase can be made in a lease term,” Griffith said. During the meeting, council members discussed how King could justify writing the letter, given that he is an attorney and not a firefighter. King said he would need some sort of documentation from the Sun Valley fire chief that the existing truck is unsafe. “I can do an opinion that says based on case law and constitution that this is a necessary and ordinary expense and there’s an urgency component,” King said during the meeting. 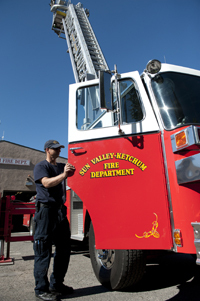 Sun Valley and Ketchum are now sharing an older-model ladder truck kept in Ketchum. Briscoe has alleged that the truck is unsafe but Ketchum leaders have maintained that it meets safety requirements. Ketchum Mayor Randy Hall has said his city plans to budget money toward purchase of a new truck in fiscal year 2015. Griffith was adamant of her desire to work with Ketchum to create a mutual agreement on the acquisition of a new ladder truck. “If we go ahead and commit to this, and sign an agreement on our own, why would Ketchum ever want to come in for part of it? Why wouldn’t they just wait until there’s a fire and get use of the auto-aid agreement without paying for any of it?” Griffith asked fellow council members before the vote. However, Briscoe spoke of his desire to purchase a new ladder truck, even if the city of Ketchum is not involved in the acquisition.